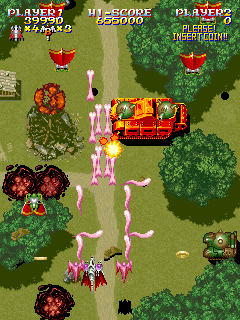 Compile was one of the premier shoot-em-up developers during the 80s and early 90s, with impressive titles like Zanac, Aleste, Blazing Lazers, MUSHA, and Seirei Senshi Spriggan. 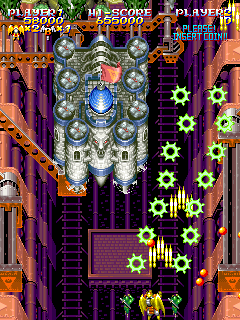 However, as shoot-em-ups became less popular, the company shifted gears towards computer development and focusing on their popular Puyo Puyo puzzle series. So a few of the developers – including programmer Yuichi Toyama and designer Kazuyuki Nakashima – left to form their own company called Raizing. This is a common pun – it obviously sounds like the English word “Rising”, although stylistically spelled, but pronounced in Japanese, it’s read as “raijin”. This means “god of lightning”, hence the lightning bolts in their logo. 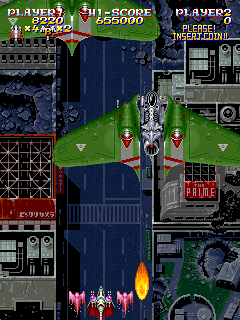 The boards for their early arcade titles were apparently licensed from Toaplan, who by this point in 1993 was in the process of going out of business. But more than their hardware, many of their design philosophies were also inherited from the company, as well as carrying over some elements from their days at Compile. They often developed and published jointly with another company, Eighting, and the two ended up becoming singular entity in 2000. 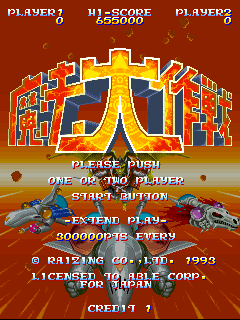 Raizing’s most famous games are probably Battle Garegga and Soukyuugurentai, but they’re also known for the Mahou Daisakusen trilogy, as well as a handful of other, lesser known titles. They’re all varying degrees of fantastic, with some obviously better than others, but all are worth playing to some degree. The company’s relative obscurity may have to do with the fact that not even half of their library was ported to consoles – and almost none of these made it outside of Japan. Even though not all of their games in a series proper, they all share many common elements. 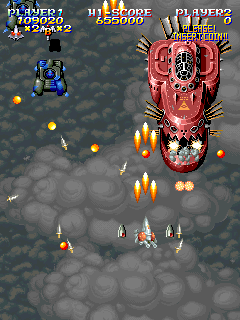 They inherent an aspect of Psikyo games, in that they’re filled with strange player characters, although these generally just appear in the character select screen or in between levels to say something silly – in game, you’re usually piloting some type of ship. 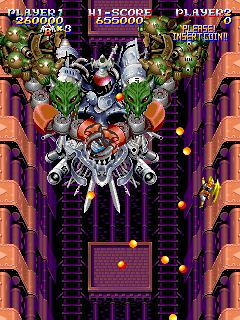 Many games share characters too, and one of the later games, Armed Police Batrider, even reuses many of the same bosses. 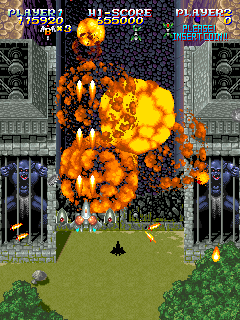 The action is usually fast and intense, somewhere in a midway point between Psikyo and Cave, as they’ve got some outstanding production values, with some high quality sprite work and generally excellent soundtracks. 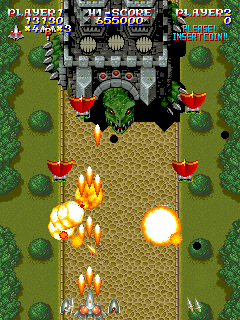 Unlike many arcade games, there are also cheat codes hidden in many of them, allowing you unlock secret characters or alter small things, like color type or extra option formations. 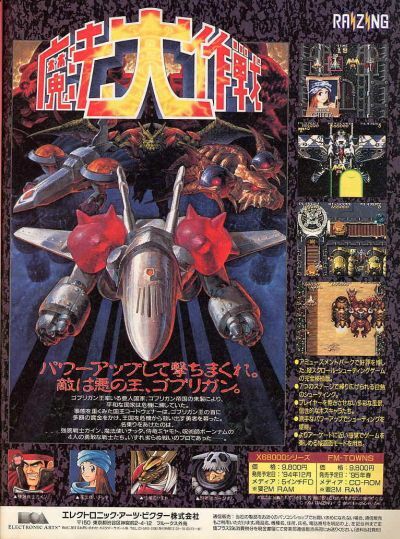 Raizing’s first game is Mahou Daisakusen (“The Great Magic War”) also known under the English title Sorcer Striker. 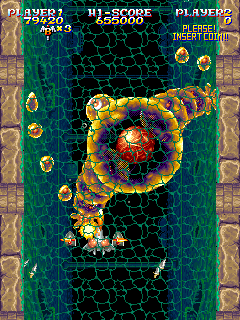 In some ways it’s the spiritual sequel to Compile’s PC Engine CD shooter Seirei Senshi Spriggan, in that it’s a hybrid of fantasy and sci-fi elements, featuring flying mechas along with magic. (It’s also much closer than its actual PCE sequel, Spriggan Mark 2, which lost the fantasy theme in place of a more Gundam-like sci-fi tale.) 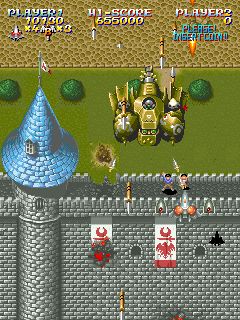 Many of the enemy designs are archetypal of the fantasy genre but with a modern military twist. 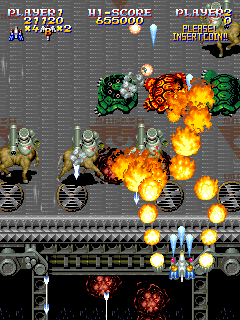 Dragons look like they have been fused with bomber planes, gigantic tortoises have stone fortresses mounted on their shells, and cyborg centaurs shoot arrows while rolling off factory assembly lines. Ships have flowing capes. 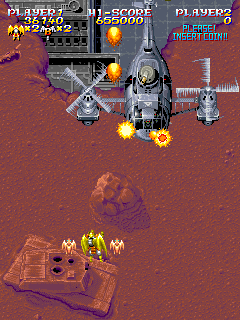 Harpies carry bombs, and goblins even ride helicopters. 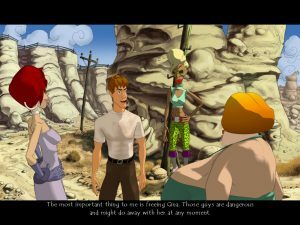 The characters are all based off of typical RPG classes and races too. 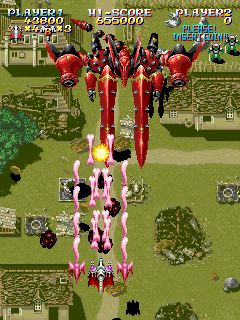 The basic weaponry system is borrowed from several other Compile games. Your fighter has two weapons, a main forward-firing shot and a more versatile subweapon. 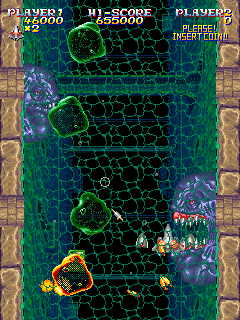 The main shot is enhanced by grabbing coins from by “P” bags, while the subweapon can be changed (or upgraded) by picking up one of three kings of magic books. 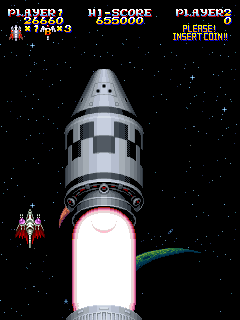 Red gives you extra homing shots that are usually slow, but are good at clearing enemies. 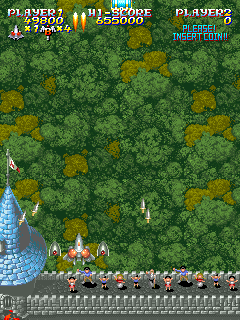 Blue gives you a sort of spread shot that hits enemies on the sides and diagonally. Green simply shoots straight and does the most damage. The main shots are basically identical between the four characters, but their usage of their subweapon changes substantially between them. 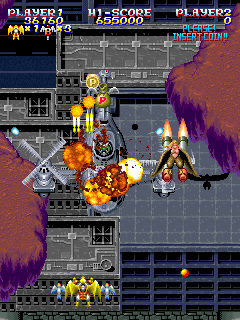 Each character also has the use of screen-clearing bombs, which are fairly prevalent compared to other shoot-em-ups. And yet, in spite of inheriting this system, it actually doesn’t play much like Compile’s other shooters. Since they were developed for the home audience, they were often pretty long, and not overly difficult. 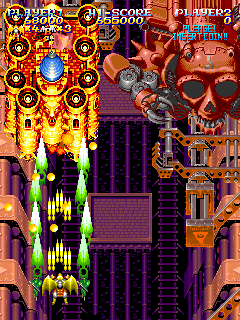 Mahou Daisakusen is instead much closer to other arcade shooters, particularly Toaplan’s library, with shorter stages (six in total), faster pace, and a vertically oriented screen. It’s also much more difficult, though not overwhelmingly so. Beyond the graphic design, the game truly excels at creative level designs. One stage takes place in a series of narrow castle corridors, where the walls start to move and attempt to crush you. 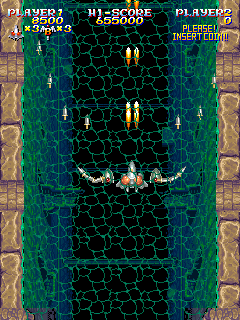 Once you beat the mid-boss, its explosion breaks the dam, which causes the entire remainder of the level to flood. 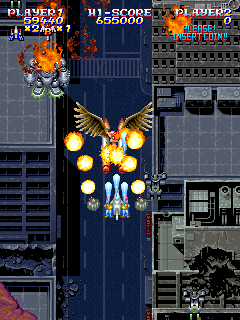 Another stage takes place over the ruins of a modern city, implying that the game actually takes place in the distant future, after our own society has crumbled. 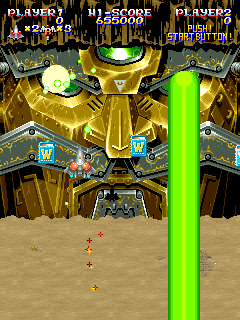 One boss arrives by jumping out of the warhead of a gigantic missiles. 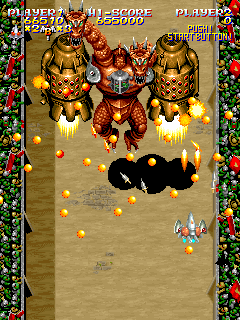 An entire stage is devoted to a coliseum type battle, consisting entirely of mini-bosses, where the onlookers bombard you with coins upon your victory. 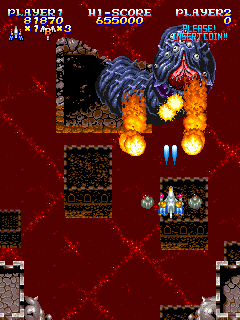 At the end, you run across the king, who, instead of congratulating you, dives into the ground and turns his entire throne into a gigantic laser spewing face. 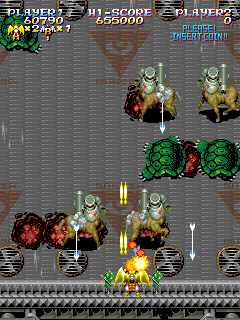 Similar to MUSHA, another one of Compile’s titles, there’s a recurring flunky named Bashinet, who is relegated to mini-boss status throughout most of the game. He starts as a gigantic red fighter, but eventually grows a full mecha body. One of the final stages appears to be little more than a victory run, with the entire kingdom coming out to congratulate you – until a wrecked Bashinet comes from the sidelines and momentarily threatens the life of the monarchs, leaving you to save the kingdom once and for all. The soundtrack was written by Atsuhiro Motoyama, who had previously worked on various Naxat titles, and became a regular employee of Raizing. It’s not terrible but not particularly memorable, especially compared to the sequel’s far more compelling music. 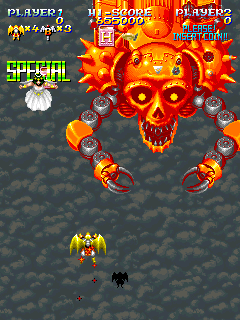 Mahou Daisakusen is an excellent game, though one that tends to be forgotten in favor of Raizing’s more innovative and ambitious titles. It’s a good choice for those who find themselves too overwhelmed by some of the later titles aimed at expert shoot-em-up fans. 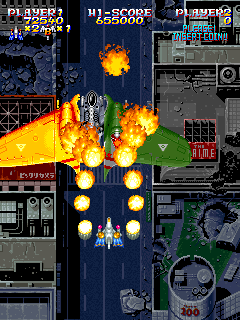 The game received two ports to the Sharp X68000 and FM Towns, published by Electronic Arts. The Sharp X68000 version is a solid port, with a number of options as well as support for various MIDI devices. The FM Towns version seems to be a port of this, which unfortunately means substantially degraded performance and many missing effects. The redbook audio soundtrack is just a recording of the X68000’s MIDI soundtrack. 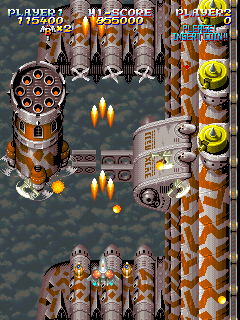 Both offer a re-oriented 4:3 mode as well as an alternate resolution similar to the vertical arcade cabinet.